HoneyPunch is playing a Cinco de Mayo show at ModCloth's temporary Fit Shop in Austin and we couldn't be more excited. You mean...we get to play dress up AND play music??! YES! With fantastic modern, retro and vintage styles there will be something there for everyone! So come on down and celebrate Cinco de Mayo with us and try on some lovelies! Read more about ModCloth's irl tour and get a sneak peek of their Austin location on their blog. ​Try It On for Size: The vast majority of our in-shop styles are available in a full range of sizes from XS through 4X! From the Store to Your Door...Your faves will be shipped from the store to your door for FREE! ...And More! Check out our assortment of jewelry, vintage, & decor available to take home today. We're playing the Saturday before Mother's Day so come to the Austin Flea at Opal's where you can buy something lovely for yo' mama, jam to some HoneyPunch tunes and enjoy a local beer! Kids and pups are welcome. You might even consider bringing your mom along. Mamas love them some HoneyPunch! "Whiskey & beer complement burgers & pub grub, with plenty of seating on the dog-friendly deck." 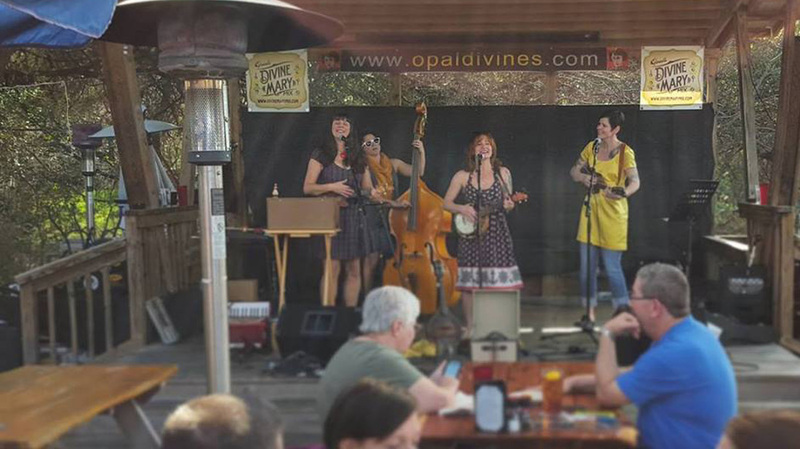 The Austin Flea at Opal's Penn Field is a great place to take your kids and pups to enjoy some music, buy locally crafted goods and down some delicious food and drink! We'd love to play at your event! Subscribe to hear about our upcoming gigs!